Amblypygi is an animal that easily found in Indonesian caves eventhough they also live understone, under bark and in forest. They have an raptorial armed and body divided into two parts. Their appearance look dangerous and poisonous even in fact they harmless and unpoisonous. 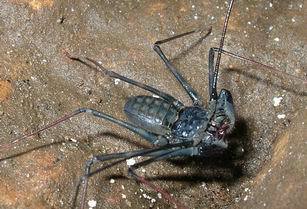 Amblypygi is predator in cave or outside caves. In caves, they eat cave crickects, cave cocroaches and other small cave invertebrate. The feeding behaviour of Indonesian amblypygi is never studied also other relates subject such as biological, taxonomical and physiological subject. As apart of Indonesian biodiversity, amblypygi is poorly known compare to other taxa. No body studied and promoted the enigmatic animals as part of indonesian biodiversity conservation. Recently, Indonesia has about three families, four genera and seven species of amblypygi published in paper (Delle Cave 1986, Harvey 2002, Harvey 2003). The first family is Charontidae with two member genera Charon and Stygophrynus, second family is Charinidae with a single genus present in Indonesian Island i.e. Sarax and the last enigmatic family and also has an odd biogeography is Phrynidae with single genus present in Indonesia i.e. Phrynus exsul (Harvey 2002). Indonesian Stygophrynus is firstly described by Gravely in 1915 with species of Stygophrynus moultoni Gravely. He had a specimen from Mr. Moulton from Klinkang Summit between Sarawak and Dutch Borneo. He described from single much broken male specimen. In same paper, Gravely also mentioned about Stygophrynus from Mentawei and Java but he didn’t describe to species. After that, Roewer in 1928 described one species, Stygophrynus dammermani Roewer from caves in Bogor. Lastly, in 1986, Delle cave mentioned about Stygophrynus cavernicola (Thorell) from Engano Island, Bua-Bua from collection of MCSTG. Originally Stygophrynus cavernicola (Thorell) is described from Farm Cave, Burma but the type specimen are lost (Delle Cave 1986). Up to now, the systematic, taxonomic and biogeography of Stygophrynus in Indonesian island is still unknown. Since many taxonomic problems are raised as mention by Weygoldt 2002 that his species from Thailand, Stygophrynus brevispina Weyglodt could be a junior synonim of Stygophrynus cavernicola and Stygophrynus forsteri Dunn. Taxonomic characters of Stygophrynus are characterized by dorsal spine of pedipalp patella that have two or three spines about equal size, row of seta on proximal edge of cleaning organ as synapomorphic of Family Charontidae (Weygoldt 1996), divided tarsus and the present of pulvilli on walking legs. The main character on dorsal spine of pedipalp patella with 3 major spines not always find in Stygophrynus. In 2002, Weygoldt described one species, Stygophrynus brevispina Weygoldt, that only have two major spine on dorsal patella (called tibia by Weygoldt). The species is resemble of Genus Charon but differed by divided pedipalp tarsus and defference development of spine. In Charon, spine 1 is reduced in size during postembryonic growth whereas S. brevispina, spine 3 that is reduced (Weygoldt 2002). A hand of pedipalp have at least three distal supplementary spines both dorsally and ventrally (Dunn 1949).